Located some 2,000 miles to the south west of North America, this is the only US state that's made up of islands, many of which are volcanic and also breathtakingly beautiful. 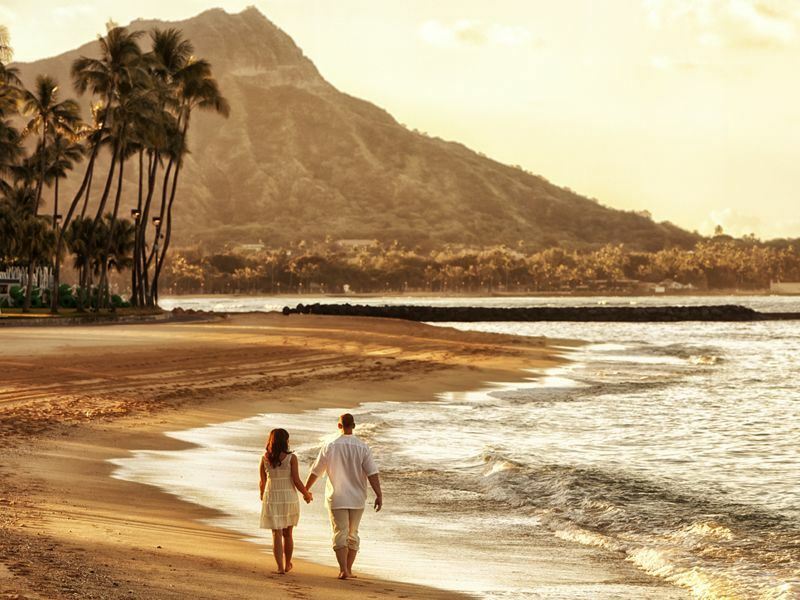 There are eight main islands to choose from, including: Maui, Oahu and Lanai, each of which have a diverse and fascinating array of mountains, beaches and national parks which make them all ideal for travelling nature lovers. One of the darkest moments in the island nation's history came in 1941 when the Japanese bombed Pearl Harbour on the island of Oahu and it's here that we start our odyssey around the beaches and landmarks of the 50th state to discover the top 10 things to do in Hawaii. 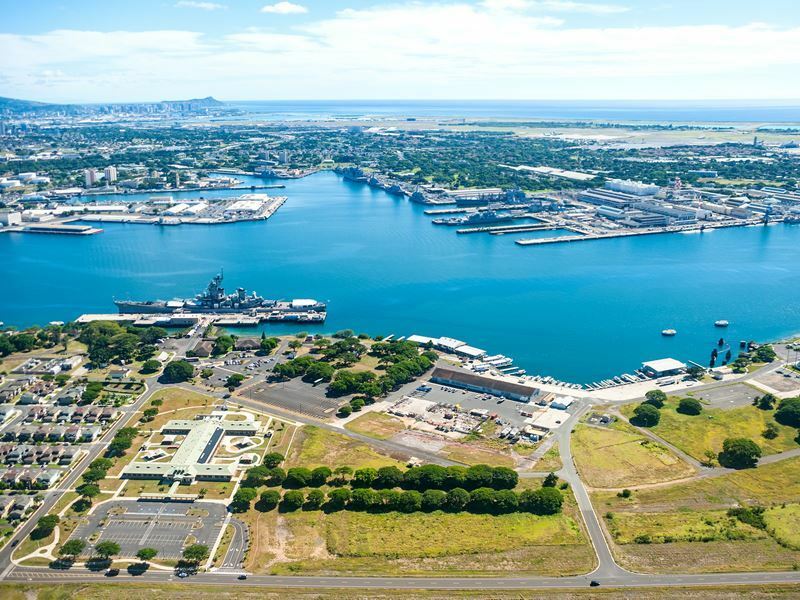 There's no getting away from it and even if you have no interest in history a trip to Hawaii pretty much has to include a visit to memorials, museums and parks of Pearl Harbour. The crews of the battleships Arizona, Missouri and Oklahoma are all remembered and stepping foot onto the decks of these massive vessels is an eerie and humbling thrill. There's also an aviation centre as well as the USS Bowfin which is now used as a submarine museum and offers tours as well as excellent panoramic views of the harbour. With two massive pools and ten super-duper slides, Wet 'n' Wild water park on the island of Oahu, is pretty much what the doctor ordered if you're travelling with the family. As an excellent alternative to the beach but losing none of Hawaii's passion for surf and sunshine, there are plenty of chances to do exactly what it says on the entrance sign and with a vast array of playgrounds, coasters and adventure mini-golf courses, covering 25 acres of parkland, this is an awesome day out no matter how old you are. Another of Oahu's hot spots is the Sea Life Park, on the eastern tip of the island, which features over 2,000 mammals, birds and tropical fish. This is the perfect place to learn more about the island's animals and habitats with exhibits, such as: the reef aquarium, penguin park and a sea turtle feeding pool, all providing a fascinating and entertaining insight into the island's ecology. Interactive programs include: swimming with dolphins and sea lions as well as the chance to wander underwater as eels, rays and turtles swim past overhead. More animal action on Oahu can be found at Honolulu Zoo which holds over 1,200 animals within 42 acres of park land. The zoo is actually situated within Kapiolani Regional Park which is the largest of its kind in Hawaii and definitely worth a visit if you fancy a change from downtown Honolulu. The zoo includes plenty of educational programs as well as a beautiful botanical garden which holds many of the plants and flowers that are sewn into the tapestry of Polynesian culture. Animals include everything from aardvarks to zebras with plenty of monkeys, giraffes and hippos in between. If you're hoping to capture a little bit of Hawaii's famous TV heritage then the resort at Turtle Bay, on the island of Oahu, allows you to do just that as right here is where they filmed Magnum and Hawaii Five-O. Aside from the large resort on the North Shore this area is widely protected and features many of the natural habitats for endangered species such as monk seals and green sea turtles. With some incredible rock formations and around 5 miles of wild beaches, this is a beautiful stretch of coastline with some excellent nature trails. If you're looking to test out your leg muscles then the Haiku Stairs will do just that because this steep trail, on the island of Oahu, is not necessarily the hardest but it certainly provides a few challenges. Also, if you're not really into heights then be warned that Haiku Stairs aka the Stairway to Heaven has sheer drops either side of the ascent although the views from the summit are certainly worth enjoying once you finally make it to almost 3,000 feet up. This legendary capital city is pretty much the epicentre of any trip to the islands and from the nearby beaches of Waikiki and Hanauma Bay to museums of art and cultural history, Honolulu is well-worth your time even if you are just passing through. Hop on-board the Waikiki trolley car that will take you on a scenic, historic or retail tour of the city and no matter what floats your boat, spas, bars or botanical gardens, Honolulu has got the lot and then some. Small and yet perfectly formed best describes this half mile stretch of beach on Oahu's windward coastline and from swaying palms juxtaposed against clear blue skies to crunchy white sand shimmering through the crystal clear waters, right here is where you find your very own tropical screen saver. 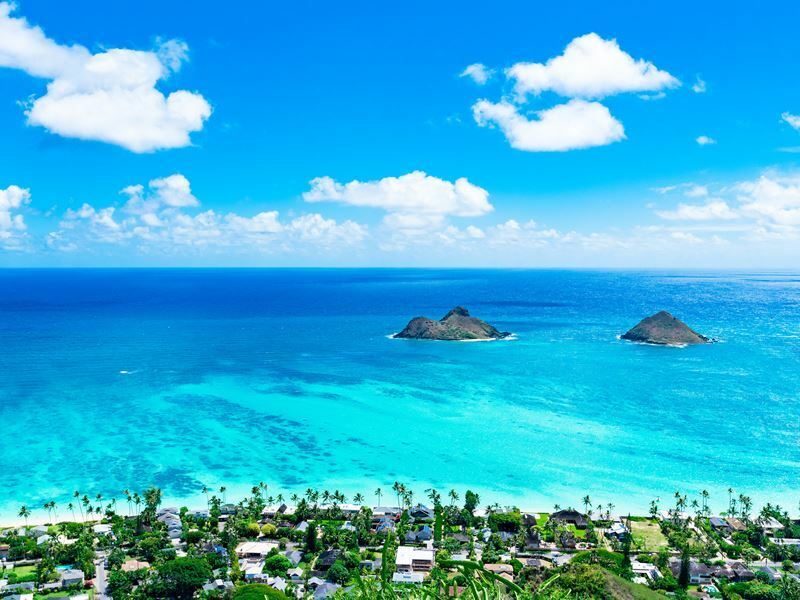 Revered as a total mecca for lovers of moon gazing as well as pretty popular at weekends, Lanikai is best experienced during the week whereupon you may get this little piece of paradise all to yourself. 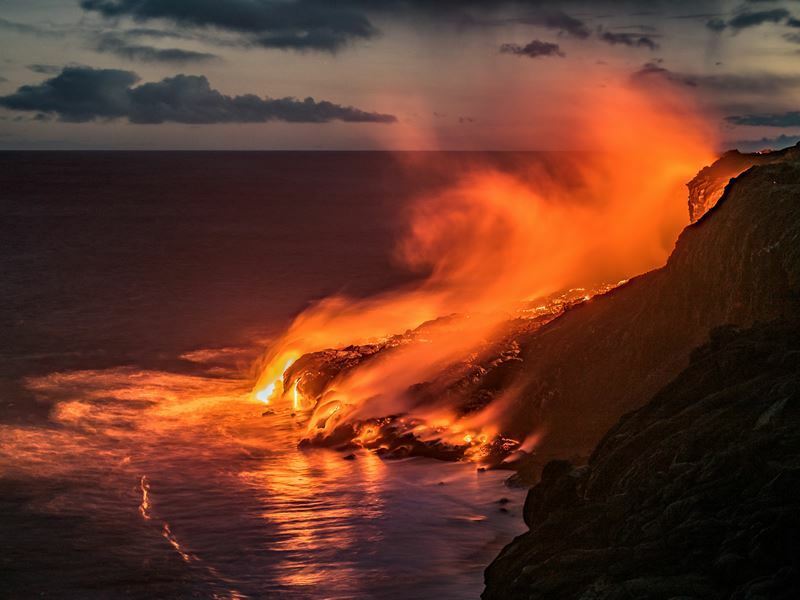 The Volcanoes National Park holds two of the world's most active volcanoes, Kilauea and Mauna Loa, which have both kinda been responsible for their fair share of destruction over the years. Anyway, aside from the volcanoes' devastating properties you'll find plenty of life on their fertile slopes in the form of verdant tropical rainforests that provide excellent walking trails past beautiful flowers and incredible views of the Pacific. Museums, art galleries and camping spots, all within the realms of the world's largest volcano – awesome! 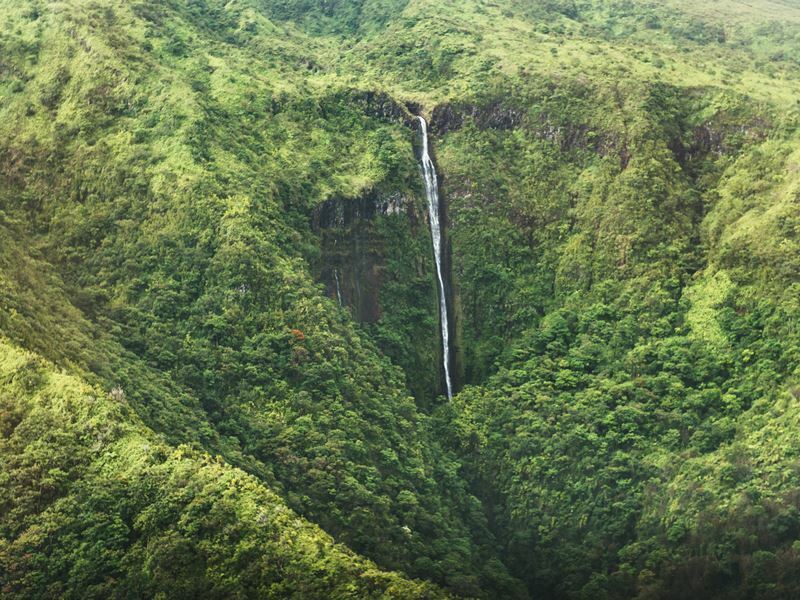 West Maui mountain range is an incredible setting from the ground let alone the air and as you trim your moustache and head for the chopper make sure you remember your PI camera as this is one experience that you'll definitely want to capture and keep for the rest of your days. Deep gorges, lush tropical rain forests and sheer cliff faces present just a glimpse of what lies in store and buzzing through the rainbow-coloured mist of a cascading waterfall is pretty much what being Magnum for a day is all about.